This entry was posted on August 25, 2015 at 9:29 pm and is filed under elephants, poetry, Uncategorized. You can subscribe via RSS 2.0 feed to this post's comments. Haha. You found a few more words than he in your own barrow. And I do not even own a barrow. But instead use a tarp to cart the leavings to the fire. So much depends on so much. Our pride included. In my first poetry class in college we started out, naturally, with “Red Wheelbarrow” — huh? We cried. It stays in memory as that challenge to understand, find meaning, against that rickety fixed object someone else has left for us. We make it our own writing our own poems — our own damned wheelbarrow, put to use our way — and leave it out for others to say Huh?, to hopefully welcome as one of the tribe’s. Your “poor but immediate equipage,” the humble work you continue to hum and magnify. Thanks. This seems as much about relationship as about words, or what we carry on our wheels–I like the actual word play that slips in, with melt-handle and huff-puff–just a lightening of tone that lifts the cover somewhat, or at least blows it back for a moment, off what we work with and how we do it, perhaps even why, and all the ways others’ innate perceptions of seeing and doing impact that. Anyway, that is possibly my least favorite Williams poem, and one I consider a bit blown out of proportion by academe, and thus also makes a perfect object lesson of the intellect trying to transport what is in the heart. Or so I read and project. ;_) A complex and also very musical piece, k.
Thanks. Yes. That’s more than it–I feel like all the objects I write about are imbued by context–since I have a hard time rising above that! Thanks for your thoughtful comment–k. I think William’s choice of the word ‘glazed’ elevates his unhampered image to art, like the memory I carry of certain impressionists paintings. You have a similar knack of excellent word placement, which always produce remarkably clear pictures in my mind as I read your words. I can see your battered but serviceable barrow. You paint the scene so well, I can see it. And I love your elephant! Ha–Michael, you are so very kind. Thank you so much for your thoughtful and generous readings of so much. It is very appreciated. K.
glazed with rain… what an incredible, articulate vision you have….. Always so wonderful to read you K…… Will you send me an elephant? Ha! Thank you, John! And so sorry to be late in returning your kind comment–I’ve been very under the gun at work. 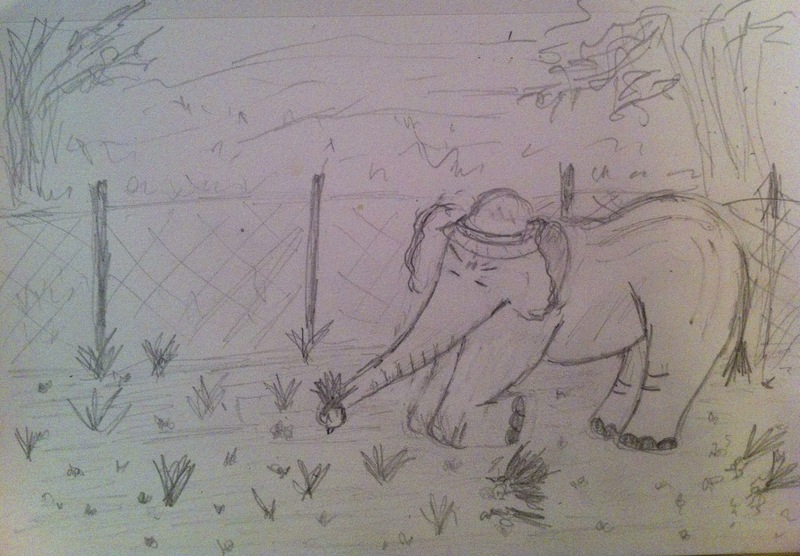 You can get an elephant or several on 1 Mississippi–my children’s book– Karin Gustafson–on Amazon. I would offer to send you one but I do not every get around to doing snail mail, so it would be a meaningless offer. Hope all is well. k.